When I was younger, I did a lot of Christmas crafting. I used to make cards and decorations and bake stuff. Then I had kids and everything changed! I’d plan to make lots of things, then feel frustrated and annoyed that I hadn’t managed to get them done. One year I tried to get round the fact that I had several tiny children by starting early. I was making stuff from August onwards. But because I’d been thinking about Christmas for so long, by the time it eventually came round I was sick of it! So a couple of years ago, I made the decision to not worry too much. I’d do a bit if I had time and if I felt like it, and not attempt anything too ambitious. There is a limit to how many decorations I can hang off the tree anyway and I don’t send that many Christmas cards. This year has been different again. Home educating my younger three means that I have boys at home in the day again. As they were showing signs of needing a break from the academic stuff, we spent most of last week doing Christmas crafts while listening to The Lion, The Witch and the Wardrobe. It was lovely! One “grown up” thing that I’ve been working on recently is an diy embroidered Christmas star. It’s made from felt with a snowflake design embroidered in the centre. The stars are sewn together using blanket stitch. 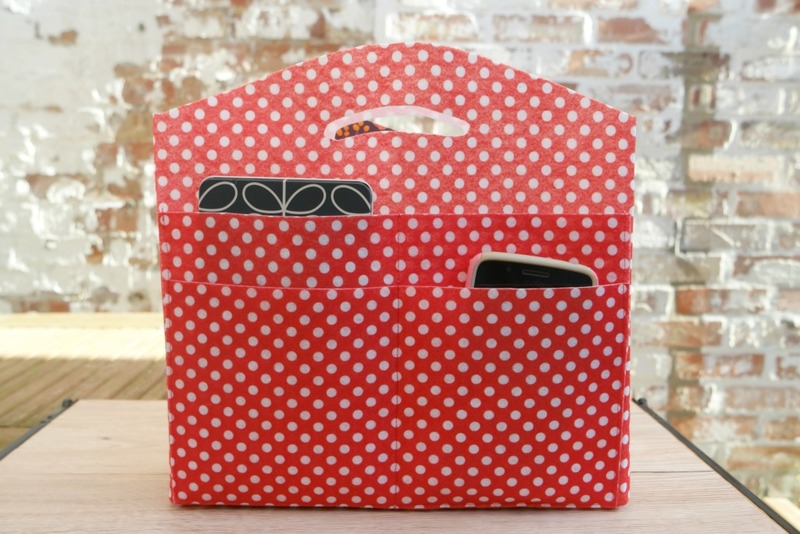 It’s a perfect project for a busy person who’s left things a bit late! It doesn’t take long to make. You can do a bit when you have a minute. You can make one, or a few and string them together. And to make things easier, you can download a template with the snowflake design at the bottom of the post. 1.Cut 2 stars from felt. 2. Embroider the snowflake design onto one of the stars. 3. Sew the 2 stars together. I used blanket stitch, but you could use back stitch or running stitch if you prefer. 4. Attach some ribbon or twine for hanging. If you would like the template I used, please enter your email address in the form below. Please note that by doing this, you will be added to the Tea and a Sewing Machine email list. I never send spam, only a weekly email containing updates, links, and other things that you might like. You can unsubscribe from these emails at any time. For more information about why I do this, please click here. Since my Christmas wreath came down, my poor front door has been left without a wreath. I’ve got plans to cheer it up by painting it a pretty shade of green, but the weather’s been either too cold or too wet! Until spring turns up (hopefully soon, so bored of winter now! ), my door needs something. Inspired by so many beautiful felt flowers on Pinterest, I decided to have a go at making some, which I could then use to make a felt flower wreath. Making the felt flowers was surprisingly easy! 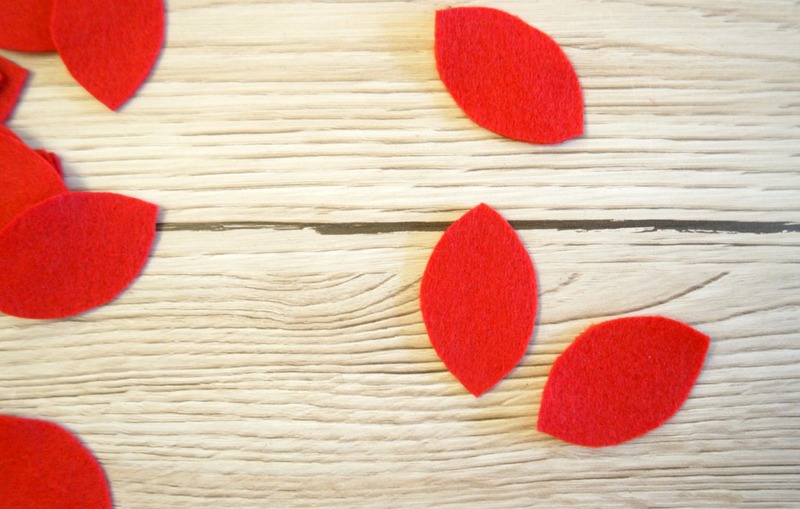 The best kind of crafts are the sort when you can get good results easily, and these felt flowers definitely fall into that category. I bought some buttons to put in the centre of the flowers, but in the end I decided they were pretty enough for a felt flower wreath without them! I have included some affiliate links. Felt (I used these felt sheets from Minerva Crafts), a glue gun , items to make the circle templates, a willow or grapevine wreath . I made three templates by drawing round a bowl, the lid of a tin and a mug. This gave me templates that were 16 cm across, 12 cm and 9 cm. In the end I decided that the largest flowers were a little bit too big, so I didn’t use them. I might glue them to hair clips and wear them in my hair instead! 1. Cut circles from felt. For the wreath I used 3 of the middle sized flowers and 9 smaller flowers. 2. Cut a spiral into the circle. As the centre of the circle will form the outside of the flower, the spiral will need to get wider towards the middle. 3. Starting at the outside, carefully roll the spiral up. To start with, the bit you cut will be the bottom of the flower. 4. Keep rolling! When you’ve rolled up the whole spiral, you might like to put a pin through the flower to hold it. 5. Using the glue gun, put a blob of glue on the bottom of the flower. Stick the end of the spiral over the base of the flower. You could probably sew them if you prefer, or use PVA glue or fabric glue, but I’d recommend using the glue gun. I’d actually not used one before, but it was very easy, the things stuck very well and the glue dried nice and quickly. 6. To make the leaves, cut a strip of green felt, then cut it into rectangles. Cut a curved bit away from corner to corner, then do the same on the other side. Don’t worry about getting them all the same size. You can use smaller leaves with the smaller flowers, and anyway in nature leaves are usually different, even on the same plant! 7. Stick 2 leaves to the base of each flower. I apologise for the lack of photos for the steps here, I got so carried away I kept forgetting to take pictures! 1. Take the 3 middle sized flowers and glue them to the wreath. I put the top and bottom flowers closer to the inside edge of the wreath with the leaves pointing inwards, in the middle flower closer to the outside edge with the leaves pointing outwards. 2. Take 3 of the smaller flowers and arrange them around one of the larger flowers. Then do the same with the other 2 larger flowers and the rest of the smaller ones. Don’t worry if there’s some wreath showing. You might want to cover it completely, but I think that being able to see wreath in between breaks it up a bit, like silences in music. 3. 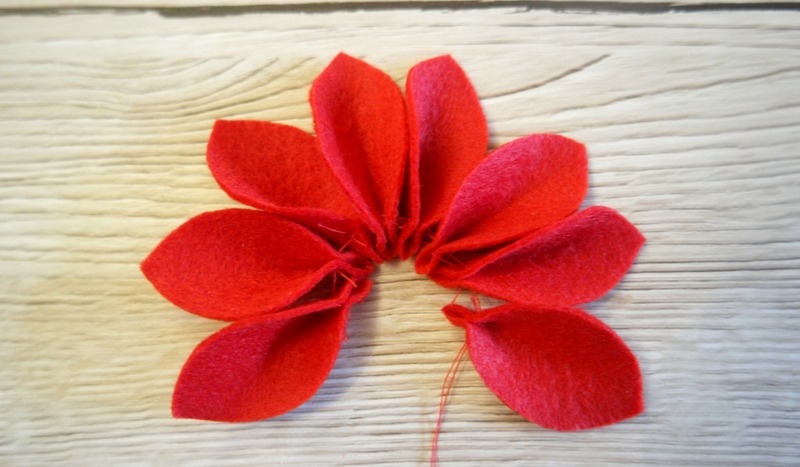 Thread a piece of ribbon through the felt flower wreath and hang it up! If you enjoy making door wreaths, you might like to have a look at my wreaths page! A splash of red is always lovely at Christmas. Poinsettias offer that splash of red, but unfortunately for any plants that enter my house, the chances of them lasting more than a week are slim. Thankfully there is an alternative for those of us who do not have green fingers! I’ve been amazed at the beautiful flowers some people are able to make just from a simple medium like felt. And once the flowers are made, they can be used in all sorts of ways, including ways that might not be possible with real flowers. 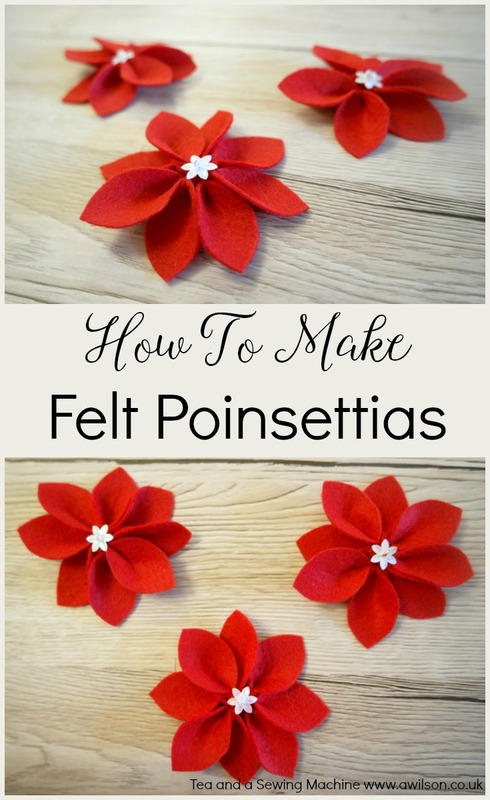 So here’s a tutorial showing how to make felt poinsettias! 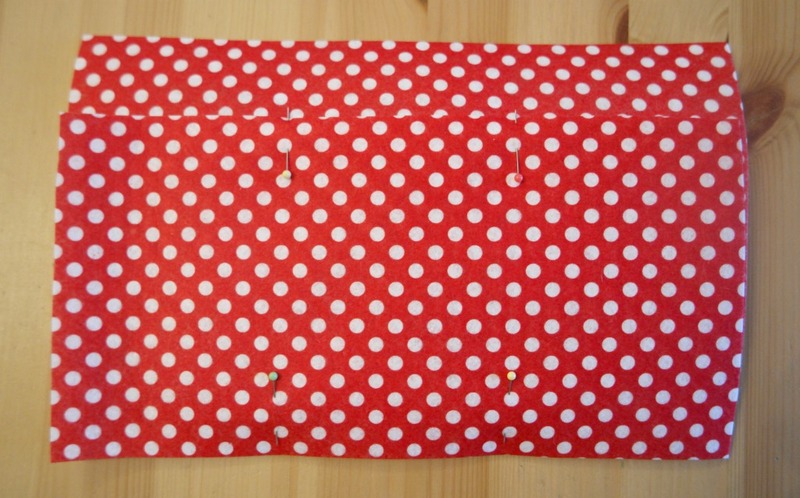 Red felt (you can buy it by the sheet at Minerva Crafts and at Hobbycraft), needle and thread, buttons or sequins and beads, template (download it here or you could make your own). If you use my template, the finished flowers will be approximately 8 cm across. 1. Make your template, or print and cut out the one I used. 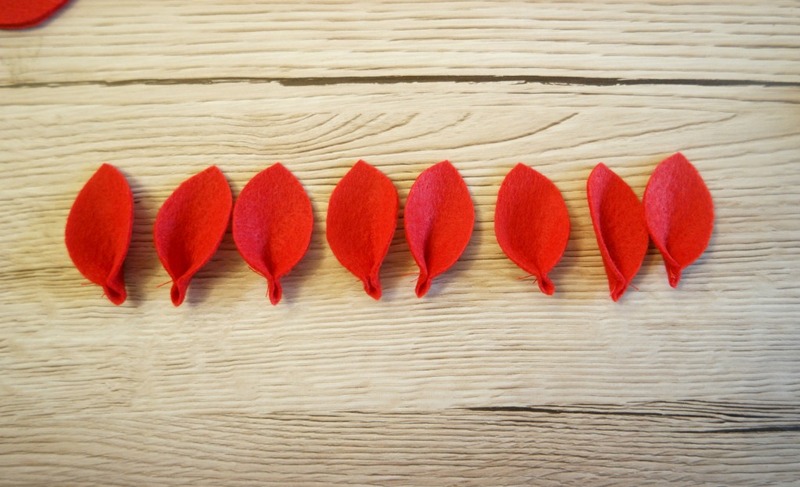 If you’re making your own, the template will need to be a symmetrical leaf shape. 2. 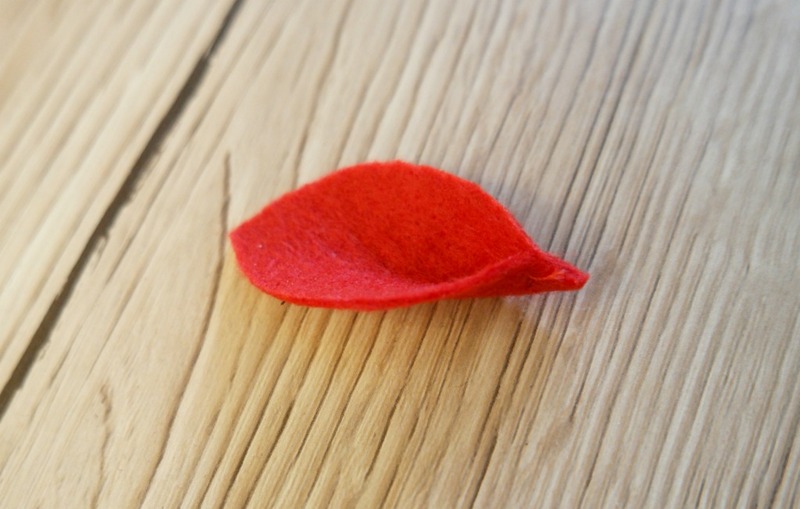 Cut leaf shapes from red felt. 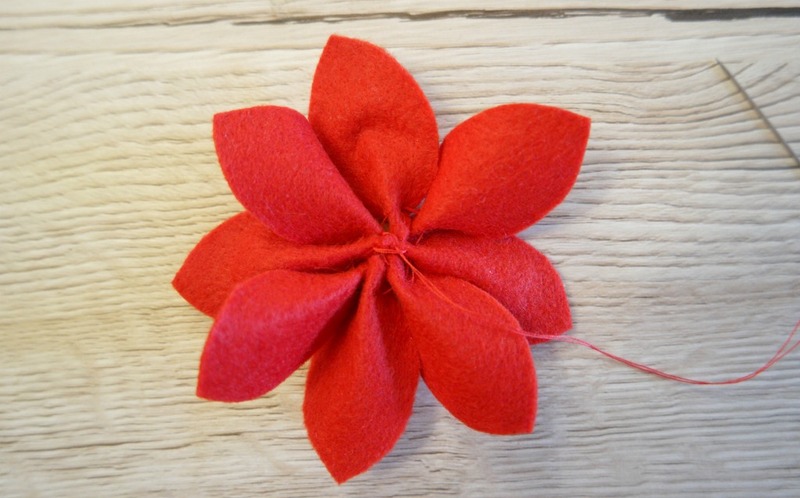 You will need 8 for each of the felt poinsettias you want to make. 3. Take one of the felt shapes and fold it in half lengthways. Sew a couple of stitches up from the point to hold the shape. Do this for the other 7. 4. With the thread doubled, thread the petals onto the needle near where you sewed in the previous step. Pull the thread through, leaving a tail. When you have threaded all the petals, pull both ends and tie them together in a knot. 5. 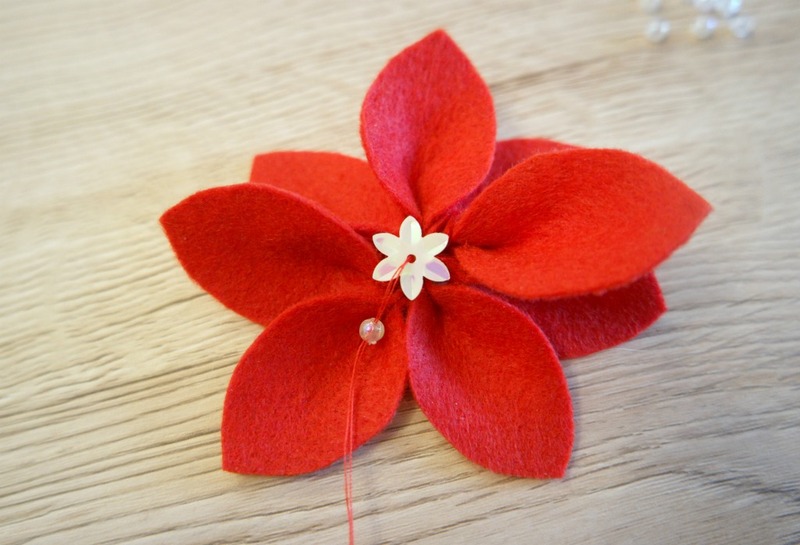 Arrange the petals, then sew a sequin and a bead to the centre of the flower. Pass the thread from the back of the flower to the front, then through the sequin. Pass the needle through the bead, then back through the sequin and through to the back of the flower. Tie off the thread. You could sew a button instead if you wanted to, or even glue a sparkly thing to the centre. 6. Use one of the tails to sew a couple of loops to the back of the flower. You can then use these loops to sew the flowers to something, or thread a piece of wire or a pipe cleaner through the loops to attach the felt poinsettias. 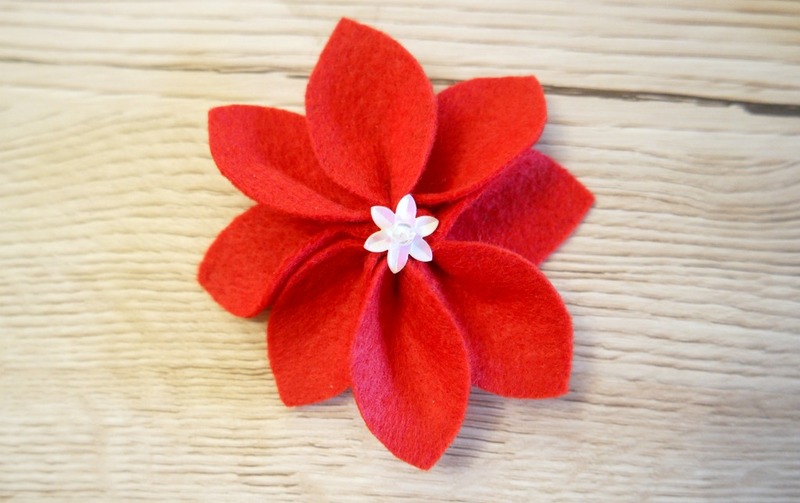 If you make some felt poinsettias I’d love to see! Share them on Tea and a Sewing Machine’s Facebook page! My favourite Christmas decorating style is Scandinavian, and after a trip to Norway last year, I love it even more! A couple of years ago I made some Scandi style felt birds as Christmas decorations. They’re the kind of thing that you can get away with leaving up even when it’s not Christmas, but the red is quite Christmassy. So I decided to make some similar birds in blue instead of red, and these I will be leaving up all year round! 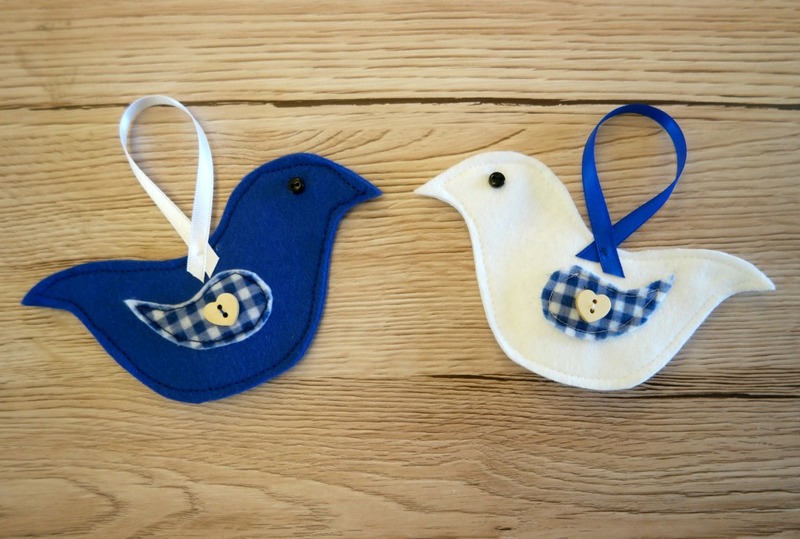 Like the ones, the blue felt birds are made from felt. Gingham felt can be hard to find, but I bought all the felt for these birds, including the gingham, from Minerva Crafts. This is an affiliate link. I sewed them together with the sewing machine, but being small, they could be sewn by hand. 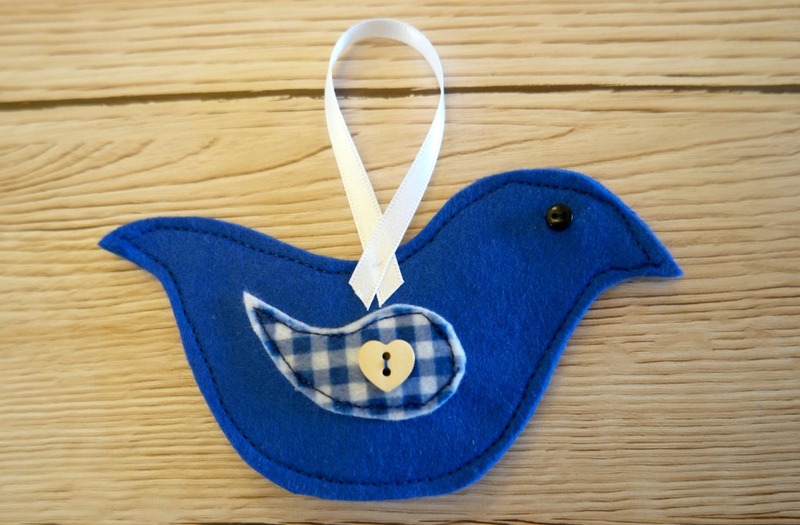 Blue felt, white felt, gingham felt, blue and white ribbon, tiny black buttons, wooden heart buttons. 1. 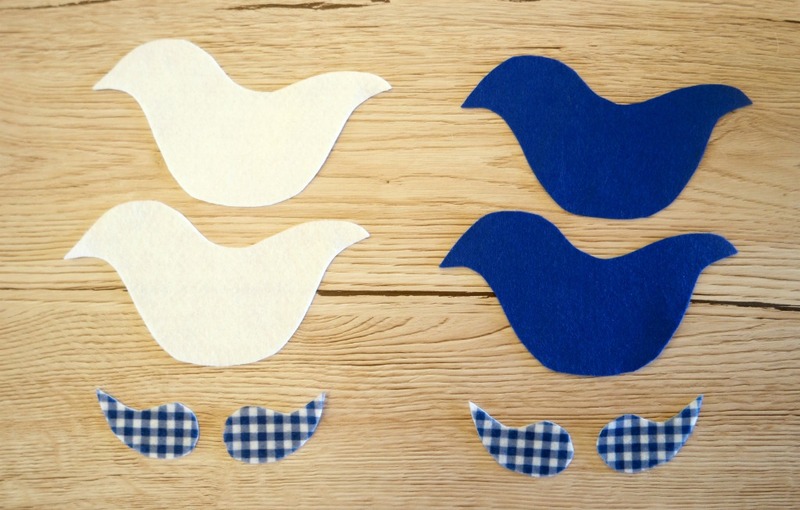 Cut 2 bird pieces from the blue felt, 2 from the white felt and 4 wings from the gingham felt. 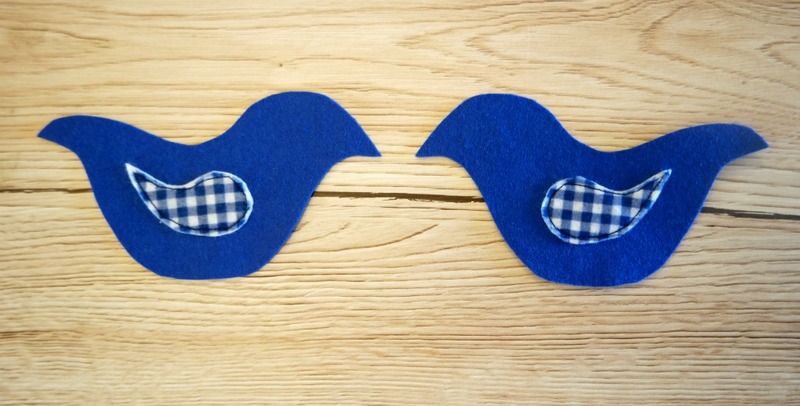 Before cutting the wings, fold the felt in half so that you have 2 wings facing one way and 2 facing the other. 2. Pin 1 wing to each bird body and sew in place. 3. 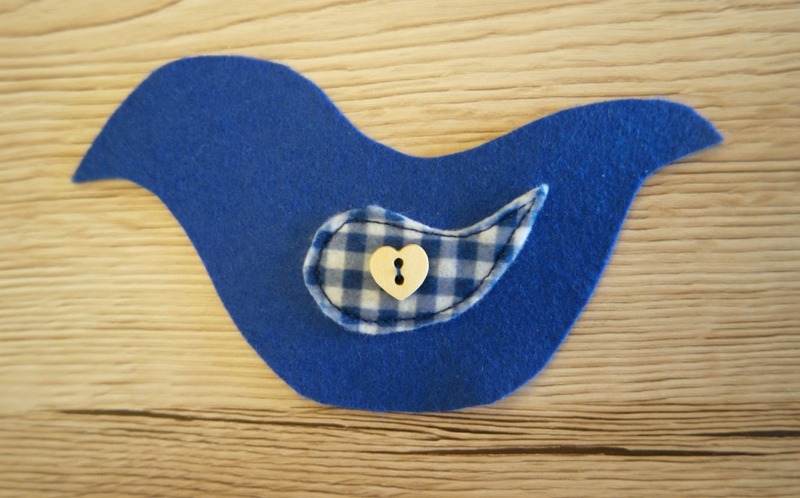 Sew a heart button to the centre of each wing as shown on the picture. 4. 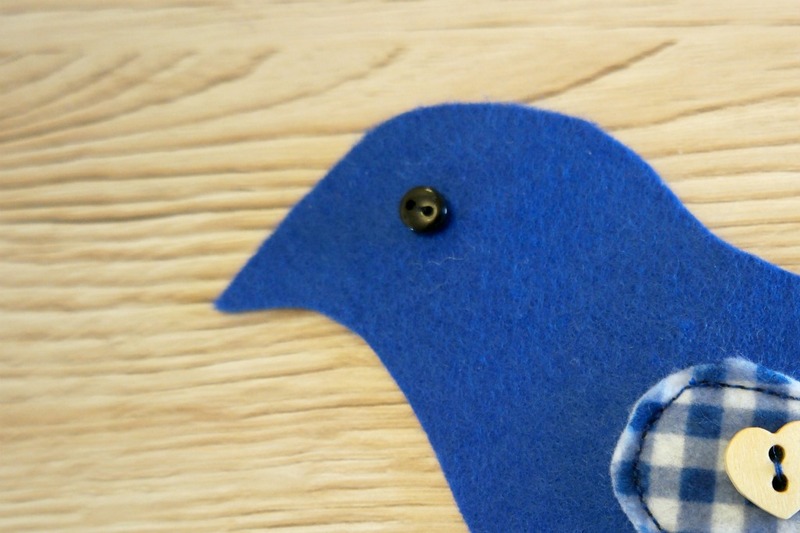 Sew a tiny black button to the head of each bird piece. 5. 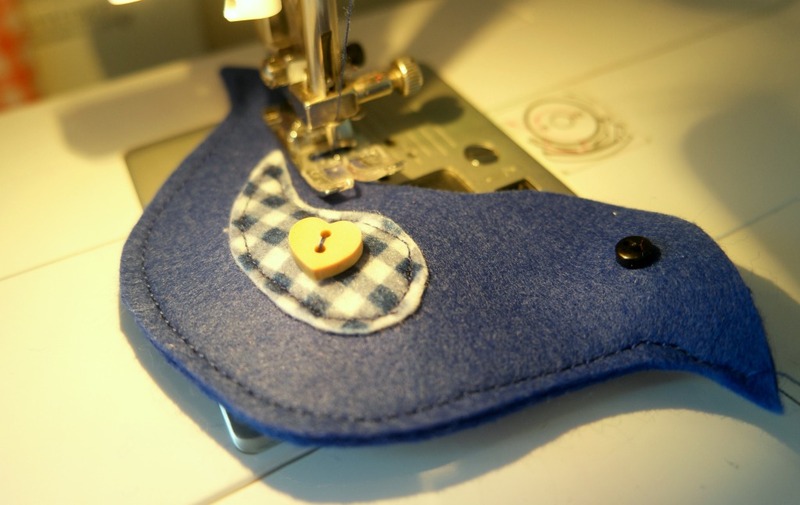 Take the 2 blue body pieces and, with the wrong sides together, sew around the outside edge of the body. Repeat with the 2 white body pieces. 6. Sew a piece of ribbon to each bird for hanging. I have kits available for these birds if you don’t want to faff about finding the supplies yourself. They’d also make nice gifts for people. 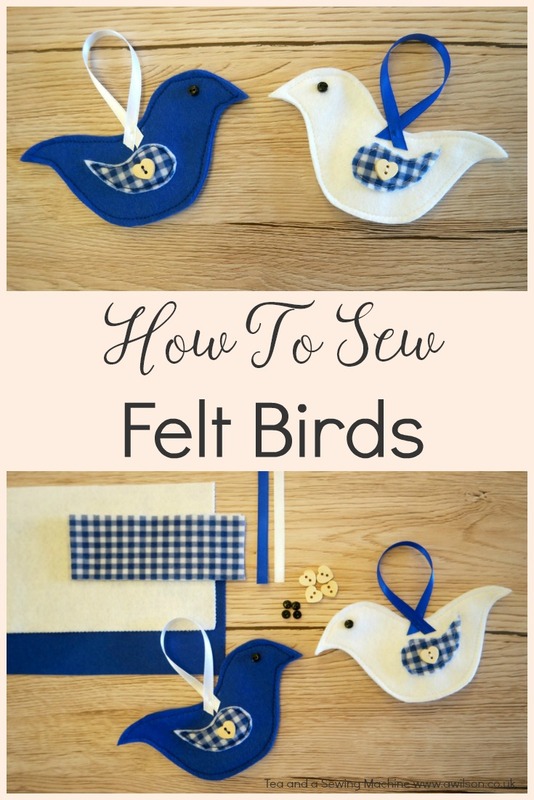 You might like the tutorial for the red felt Christmas birds. I have kits for sale for the red birds too! If you make some birds, I’d love to see! You can post them to the Tea and a Sewing Machine Facebook page! DIY Bag Organiser: The End of Losing Stuff in Your Bag! 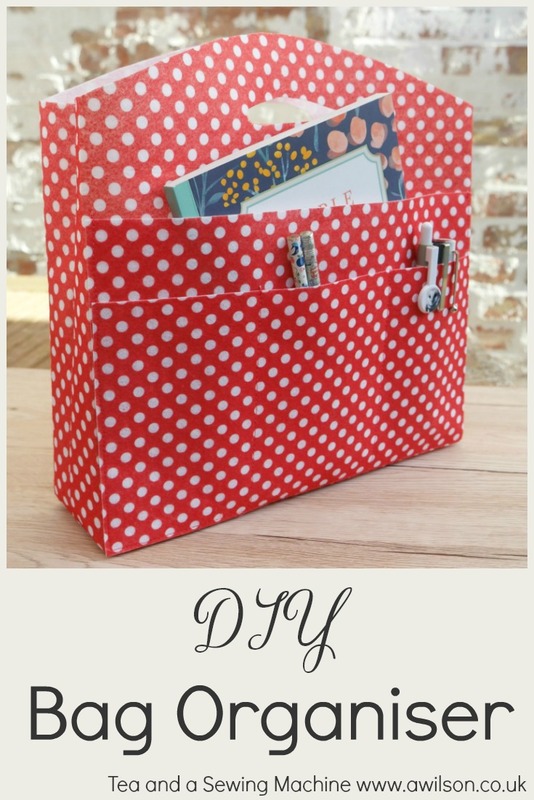 Back in July, one of my lovely readers emailed me to ask if I could write a tutorial showing how to sew a DIY bag organiser. She said that she is forever losing stuff at the bottom of her bag, and some sort of organiser might help. Having found myself more than once frantically hunting for my phone because it’s ringing but being unable to find it because it’s sunk to the bottom under all the other stuff and the assorted junk, I thought this was a very good idea! My first attempt at making a DIY bag organiser wasn’t a success. It involved sewing canvas, buckram and a lining and to be honest, it was a bit of a nightmare. I had imagined something fairly simple that would come together quickly, but this really didn’t. In the end, I ran out of time because we were going on holiday, and when we got back I didn’t have any inclination to finish it. Sometimes when things aren’t working, the best thing to do to give up and try again, and I’d definitely reached that point! So having had a few weeks to re think, I’ve had another go and this time it was a success! Instead of using fabric that needed lining and a stiffener added, I used some firm felt that didn’t need either. I’ve also kept the design very simple. The pockets don’t have gathering, zips or anything fancy, and they’re only on the outside of the organiser, not on the inside. As felt doesn’t fray, I could trim the seams closely and the raw edges didn’t need finishing. 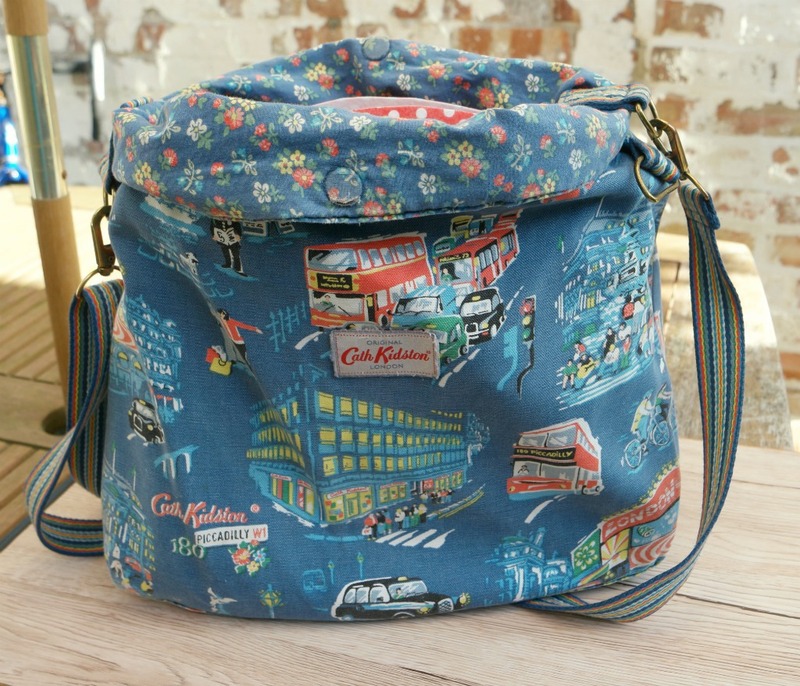 The organiser I made fits my Kath Kidston bus bag. If you have a bag that is a similar size this will work for you. If not, just adjust the dimensions so that it fits your bag. 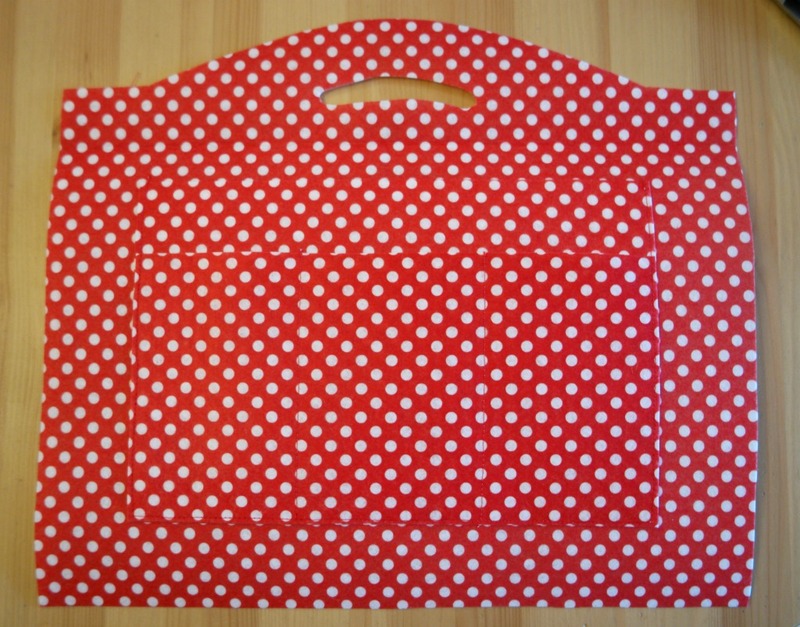 The finished dimensions of the bag organiser I made are 28 cm x 8 cm x 28 cm. The felt came from Minerva Crafts (affiliate link) and I would recommend using this as it made the whole thing so much easier and quicker! 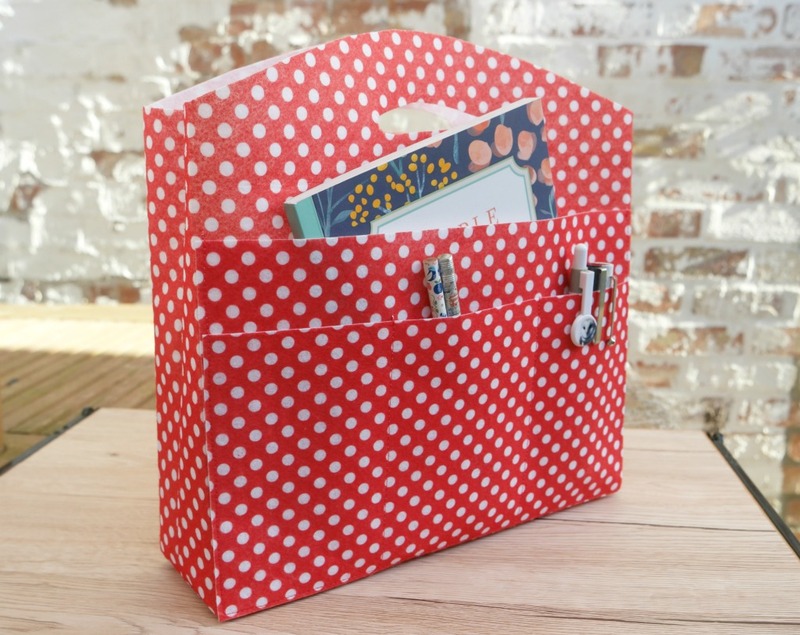 Here are the instructions for making a diy bag organiser! If you don’t fancy making your own pattern, you buy a pattern for it from my Etsy shop here. 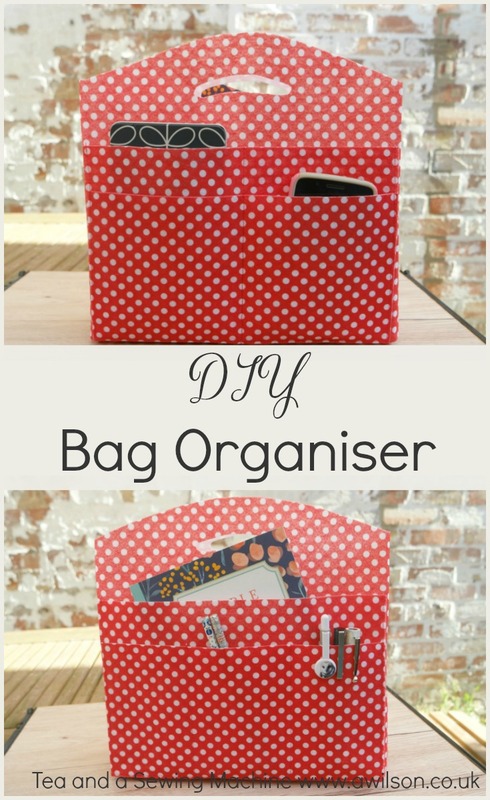 How To Make a DIY Bag Organiser. Stiff felt (affiliate link) or other fabric with fusible stiffener added, usual sewing supplies. From the felt, cut 2 rectangles 33 cm x 33 cm, 2 rectangles 28 cm x 14 cm and 2 rectangles 28 cm x 18 cm. The bag main pieces include a 1 cm (1/4 inch) seam allowance. You might want to cut a handle in the top of the bag main pieces. The handle in mine is 9 cm long and 3.5 cm down from the top. 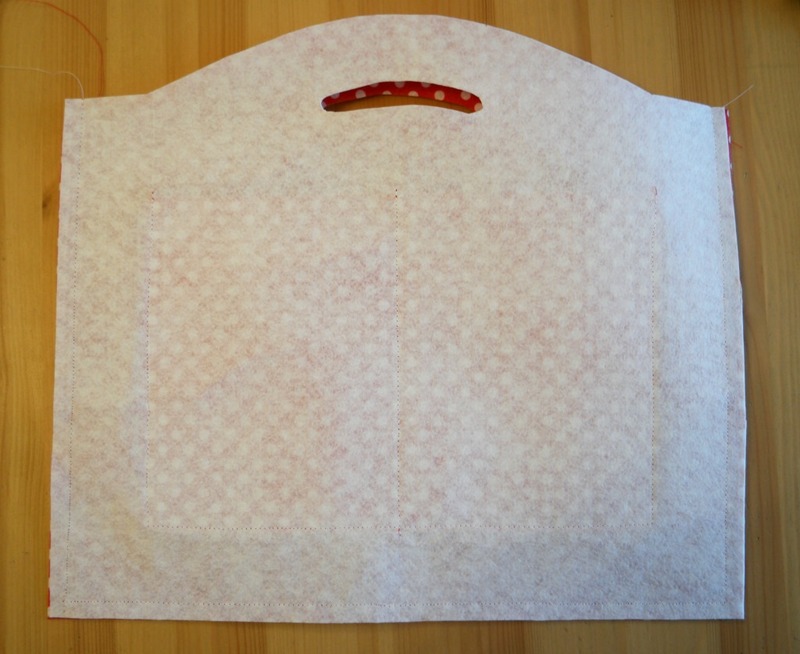 If you want to make the top of the bag main pieces curved, you could use a French curve or a plate. OR skip this stage by buying the pattern. 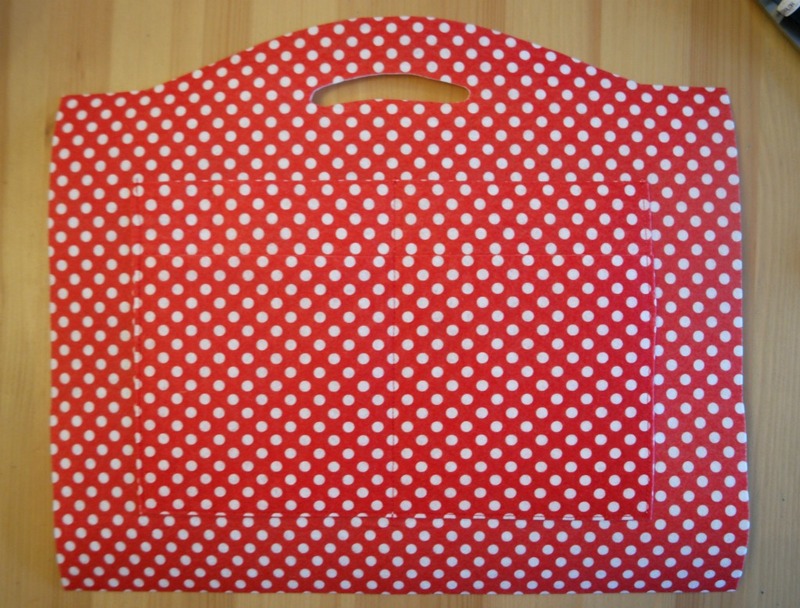 If you are using a bag with different dimensions, you will need to measure from the centre of one side to the centre of the other, and from the bottom of your bag to 3/4 of the way up the front. The pocket pieces will need to fit on the front and the back without going round to the sides (unless you want them to!). 1. Take one of the larger pocket pieces and one of the smaller pocket pieces. With the right sides face upwards, pin the smaller piece to the larger piece. Mark 1 third and 2 thirds along the smaller piece. 2. Sew along where you marked so that the pocket pieces are sewn together. The front pocket piece here will have 3 sections. 3. Now pin the pocket pieces you’ve just made to one of the bag main pieces. If you are using the same dimensions as I did, the bottom of the pocket pieces will need to be 5 cm up from the bottom of the bag main, and 5 cm in at each side. 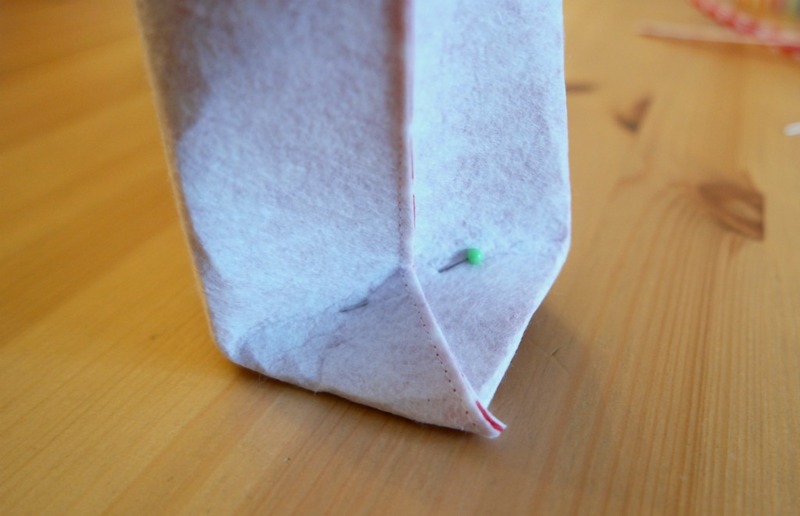 Sew the edges and the bottom of the pocket pieces to the bag main. The front pocket will have 3 sections and the pocket behind it will have 1 large section. 4. To construct the pockets for the other side of the bag organiser, pin the smaller one to the larger one in the same way as you did with the other pocket section. Mark half way along on both pocket pieces. 5. Pin this pocket section to the other bag main piece. Sew around the bottom and edges of the pocket pieces. 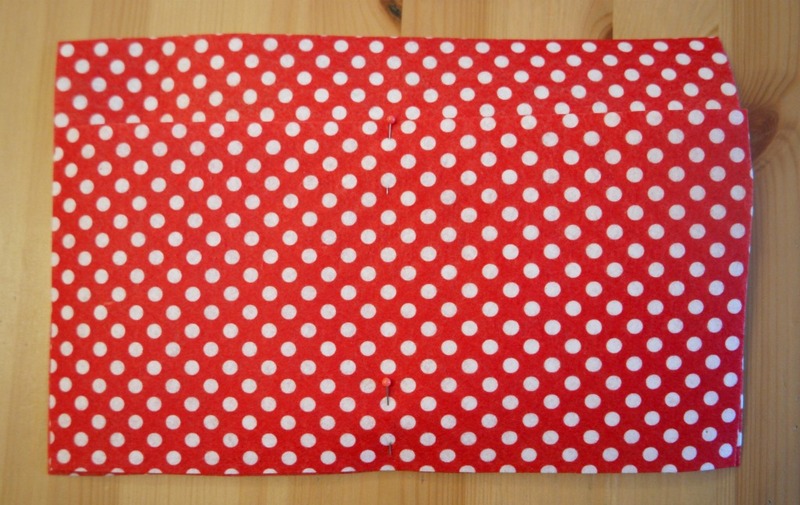 Then sew down the centre of both pieces where you marked in the previous step. This will give you 2 pockets in the front, with 2 taller pockets behind. 6. With the right sides together, pin the bag main pieces, then sew along the sides and the bottom. Trim the seams. 7. Take one of the corners and open it out. Then squash it flat so that the seams are together. 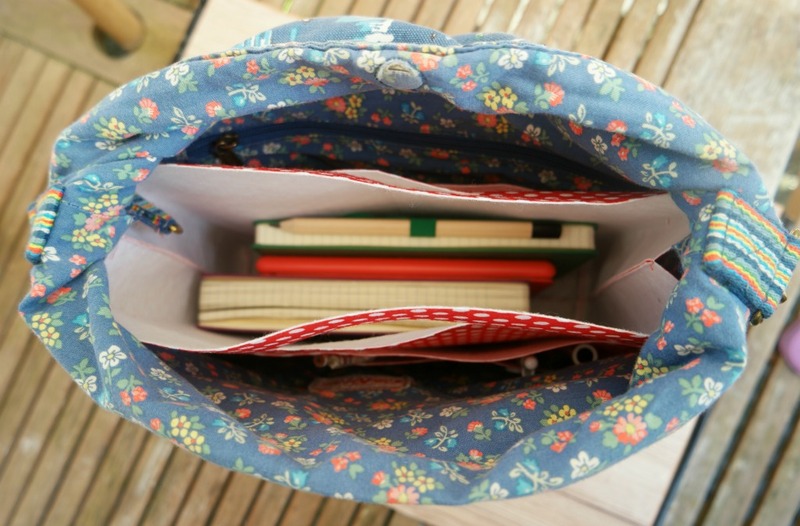 This will give your bag organiser some depth without having to faff about with a gusset. 🙂 Pin to hold it. 8. 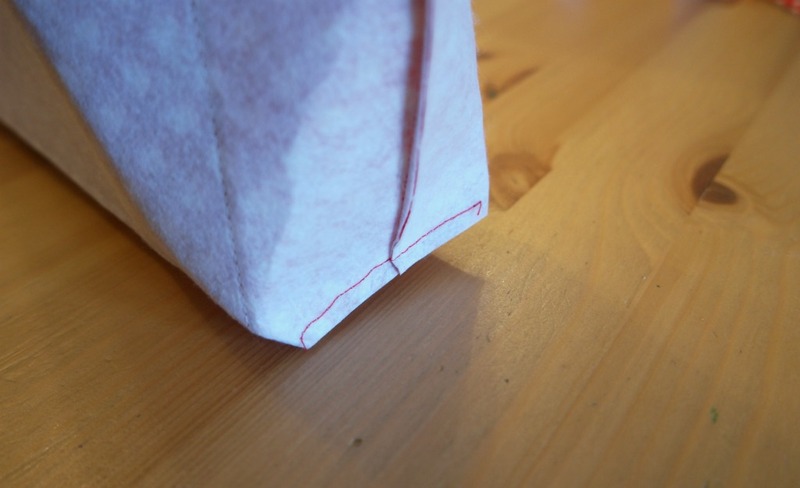 Sew across the corner at right angles to the seam, close to the bottom corners of the pockets. Repeat with the other corner, then cut the corners off. Your DIY bag organiser is done! Trim the threads and turn it out. Now you never need to lose your phone or pen in the bottom of your bag again!